Here’s one of the latest. Just finished loading the ads on CraigsList – I just LOVE the CraigsList community in Kansas City! I hope to get it sold (along with a lot of other stuff) so that I can get the garage cleared out. The end result has been identified as something special and I am determined to get to that point. Until I can see the light at the end of the tunnel, though, I am not going to announce it to the world. Just yet. 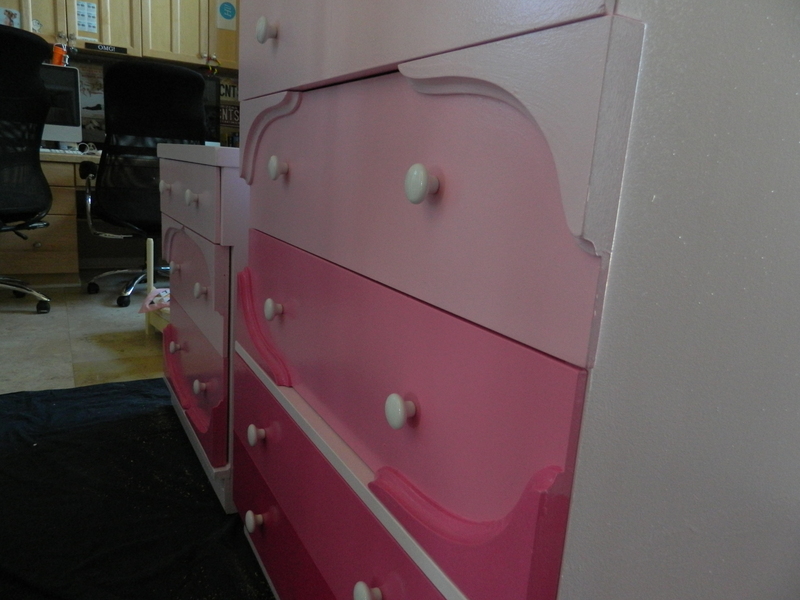 So, as you may know, I am big on restoring and upcycling old furniture. I stick (generally) to the well built pieces of furniture from about the time span of the forties to the sixties or so. They really built furniture to last using quality components – these things should last just about forever! The only bad thing is the style may not. 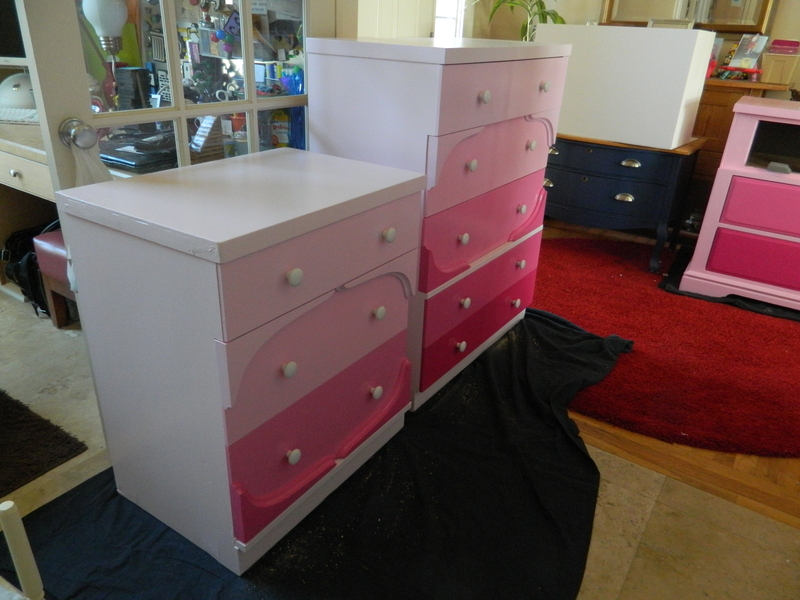 I run an ad on CraigsList almost constantly looking for parts to restore old furniture – like drawer glides and tracks – sometimes the embellishments and sometimes its feet or whole drawers. Sometimes its something as simple as a back or a matching pull. 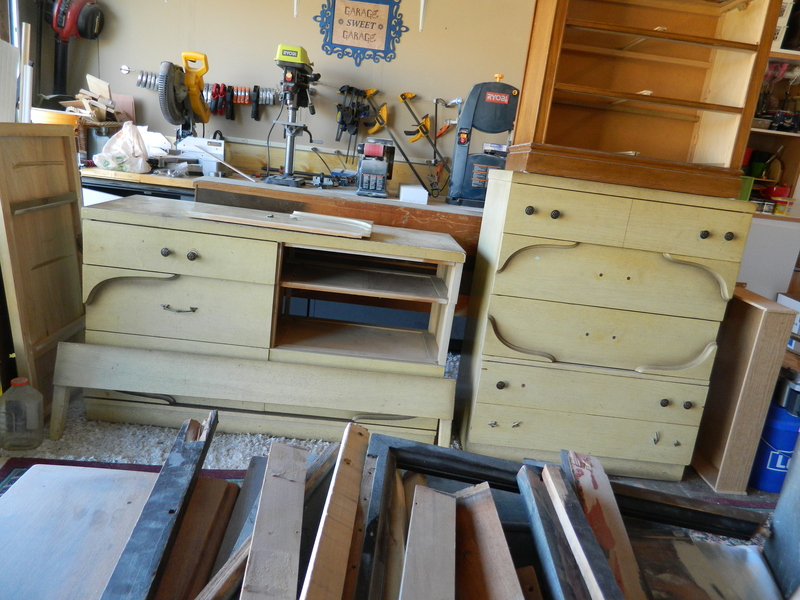 I have carefully worded the ad to say that I am happy to help make space in a garage or basement or give an old piece of furniture new life and to give the owners a little less clutter in their lives. It has netted me some great pieces. Yes, this set had been loved by someone. 🙂 And it had seen better days. Even after getting to my garage it took awhile for me to get to work on it. But once we did, it was smooth sailing. Mostly. 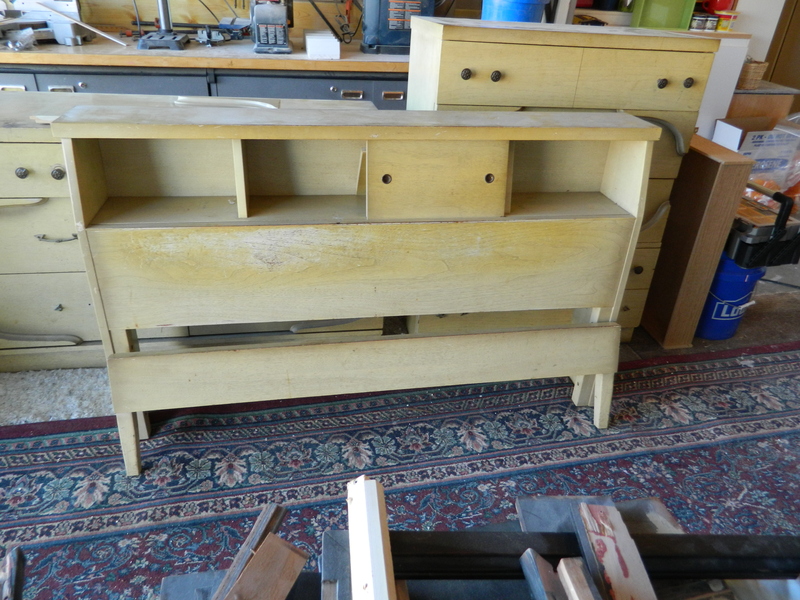 So, the dresser had a missing drawer – completely gone – and a second one that had been reduced to just the drawer front. 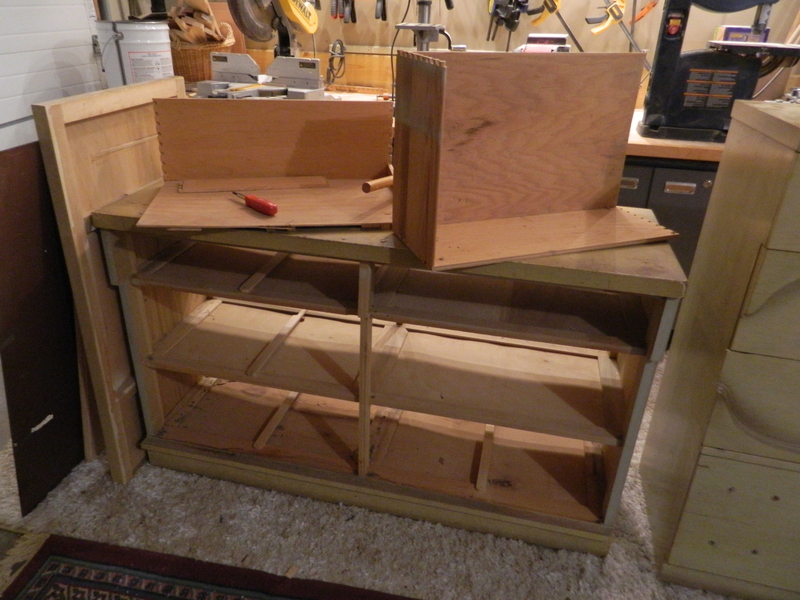 We opted to take the head- and foot-board just to serve as replacement fronts for the missing drawers. I normally don’t do the headboards as most people (at least those I know) don’t. 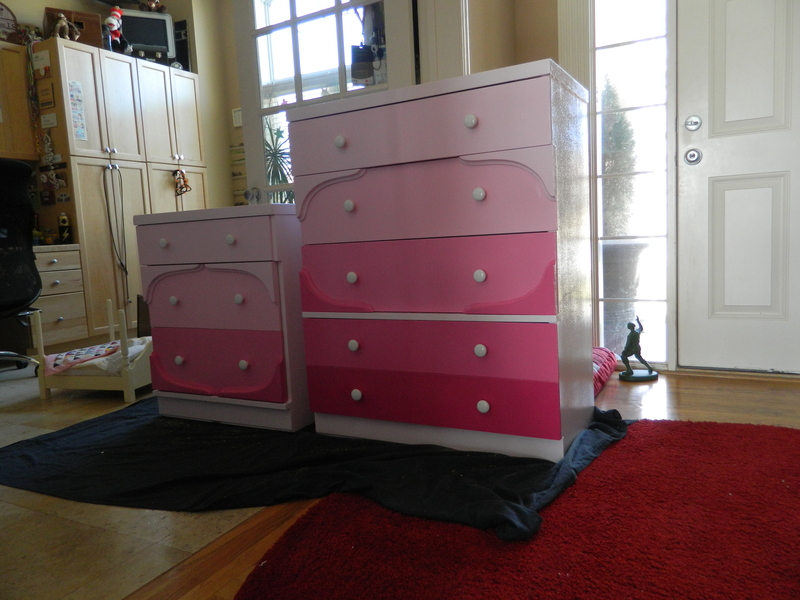 But as we set about to work on the dresser, it quickly became evident that this would be way more work than it would be worth. 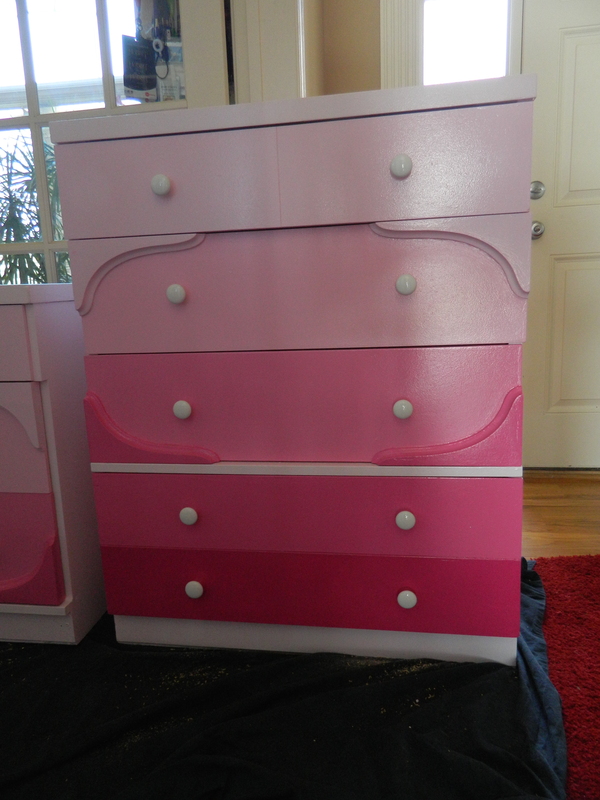 So, The Kid opted to cut it down to just three drawers – a sort of mini chest of drawers. He kind of likes to work alone, just listening to music, so I didn’t get a whole lot of photos. 😦 But basically, he took off the top, cut just to the right of the center support on all the drawers; then removed all the supporting pieces from the right side and re-attached it. Then cut down the kick plate and added a back. 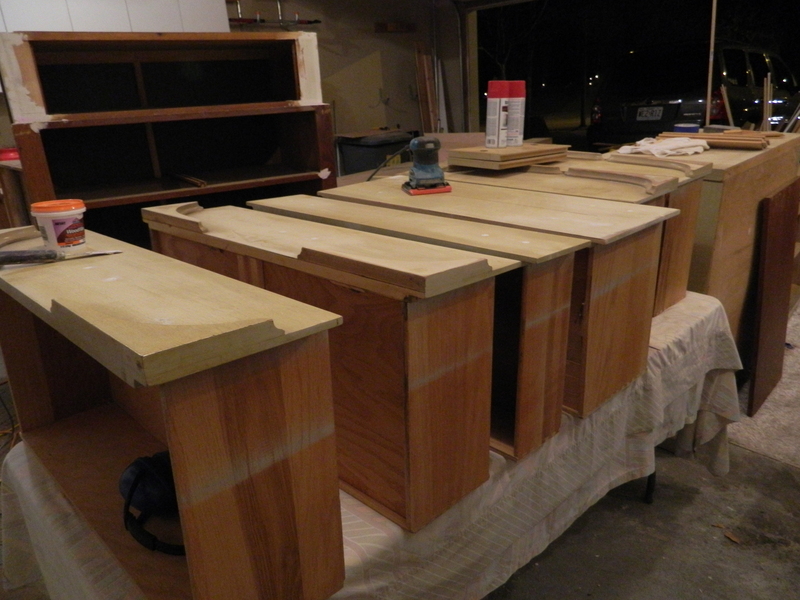 While he was cutting down the top, I worked on the drawer fronts. The curved pieces were held in place with just two staples and a dab of glue, so they came off easily. The curves almost touch in the center, but not quite; turned out pretty cool if you ask me. 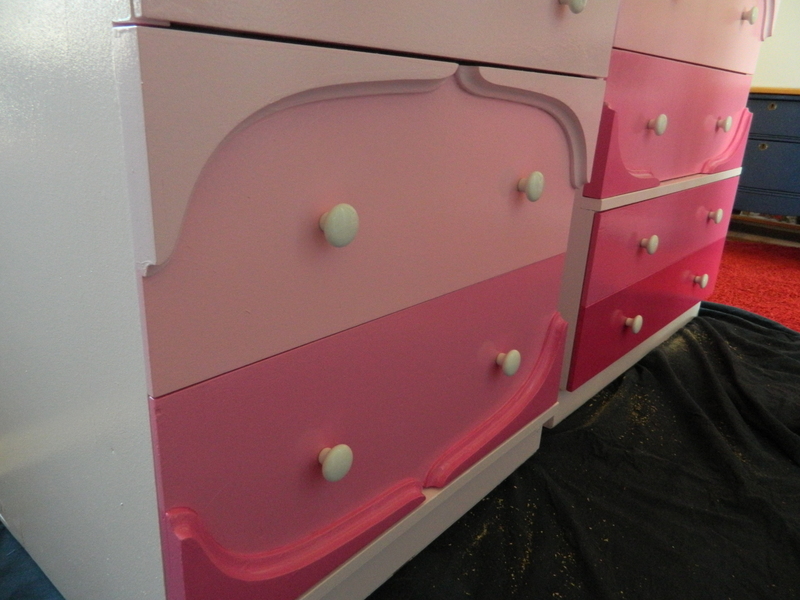 I used the shade of paint of the drawer beneath to come up and paint the curves, likewise brought the color of the drawer above the curve down. Turned out pretty neat. Nice, right? I can never get enough of this pink color scheme either. I have no doubt these will sell quickly. 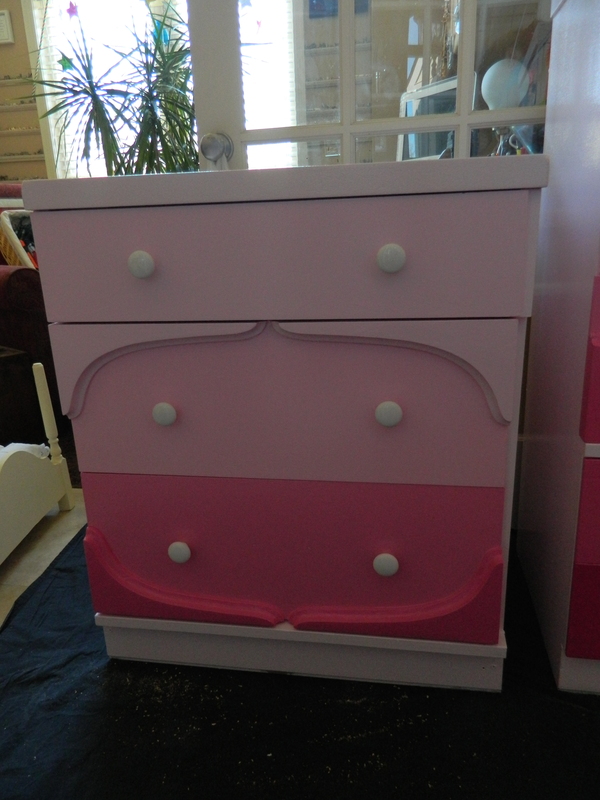 The head- and foot-board are being painted the same blush pink as the cabinets and will be offered to whomever purchases the dressers. I wanted to try my hand at something unique for them, but I am coming up blank. I half jokingly told my son that I wanted sprinkle pink glitter all over the wet paint, but he gave me “that” look. You know that look… the one that says he thinks his mom has gone off the deep end! Ha! Lots more things on the verge of being done. This has been some busy days and I am looking forward to all the upcoming posts. Hope you are too!